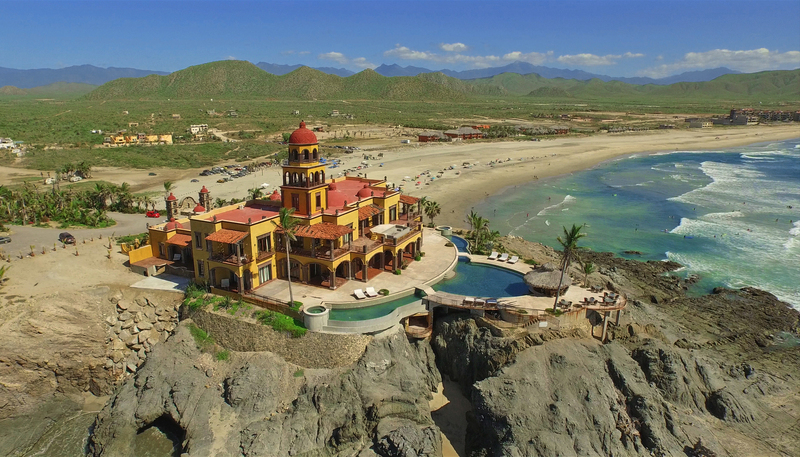 Strategically situated on one of the best surf breaks in the Southern Baja, Hacienda Cerritos sits atop a rock formation jutting out into the rhythmic waves of the Pacific Ocean below. The lookout tower, in the center of the property, has 360-degree vistas looking north, south and seaside, as well as the inland mountains, which act as a scenic backdrop to the exquisite Spanish estate. Adorned with authentic and rustic-wooden Spanish furnishings, the luxury boutique hotel has been an icon since its inception in 2010. Home to location filming, intimate concerts, weddings, fundraising events, corporate retreats and political engagements; Hacienda Cerritos is perfectly situated just south of the Art and Culinary epicenter of Todos Santos and less than 40 miles north of Cabo San Lucas. It’s location acts as both an escape from the electric-Cabo San Lucas, while also a much-appreciated midway point for adventurers traveling through to Todos Santos, the Capital city of La Paz or up the Baja. The town of Pescadero is known for it’s rich agriculture, artisan array of local goods and beach enthusiasts from around the globe. The area has seen steady growth from locals, ex-pats, luxury condominium developers and international hotel operators. In the last couple of years, Pescadero has had an infusion of farm-to-table restaurants, organic markets and extreme sport activity operators who have moved in to meet the area’s demand. Hacienda Cerritos sits on a commanding and prime point of the bay, encompassing 74 meters of Pacific-Ocean frontage. The Luxury Boutique hotel is adorned with 11 rooms, 13 bathrooms, 4 pools and hot tubs, 10 fireplaces, 2 full culinary kitchens, game room, library, gym and helicopter landing pad. The estate sits atop a cliff in a prime location a short drive from the coastal highway 19, in the developing area just north of Cabo San Lucas. The property has Federal beach concessions in place and rests above one of the few swim-friendly beaches in all Los Cabos; known for surfing, snorkeling, kayaking and a myriad of beach activities. The Spanish-style estate sits on approx. 4,204 sq mtrs of land. GREAT ADDED VALUE CONDITIONS – For an interested buyer with hopes of expansion, he/she could take advantage of the approvals-in-place and create an additional two towers, with up to 120-keys, to maximize the utilization of the property. With a larger vision, a developer could extend the current property south and utilize other beach frontage available from the same owner. To increase the area and fulfill the needs of a full resort, a developer could opt-in for the additional 25-Acres of beach frontage and expand their business plan to well over 900-keys. UNDER DEVELOPMENT – Los Cabos lodging market has enjoyed a healthy and steady recovery, following the economic downturn of 2009 and 2010. The existing and newly developing projects include high-end resort communities and condominiums, time-share resorts, service hotels and mix-use projects. Hyatt recently inaugurated its Hyatt Place San Jose del Cabo with 157 rooms. There were approximately 900 rooms that opened their doors and started operating at the end of 2015, including the 300-room JW Marriott Puerto Los Cabos and the 124-room Ritz-Carlton Reserve Puerto Los Cabos. RESIDENTIAL MARKET – According to the Multiple Listing Service of Baja California Sur, new sales have increased in 2014 and 2015, by 23% and 26%, respectively. The sales report for the first two quarters of 2014 show a rapid recovery in sales on residential properties (condos & houses) with a total sales volume of approximately $105,069,822 US Dollars. The average sales price is up by 15 percent, reaching an average of $555,925 US Dollars.